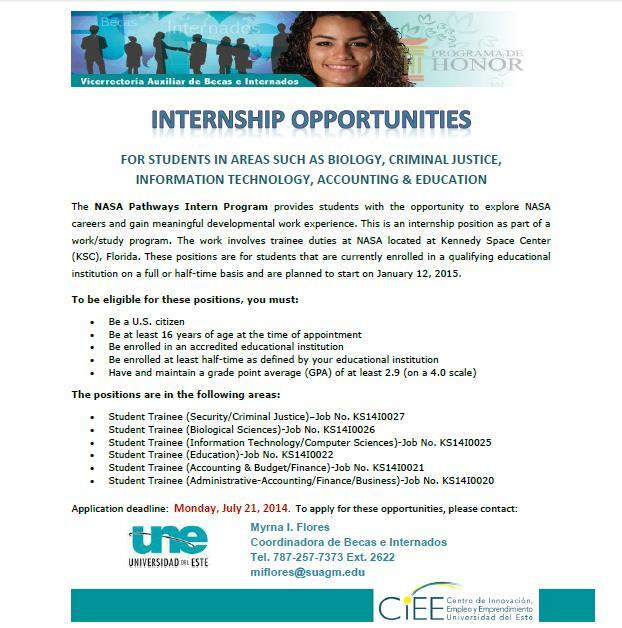 Universidad del Este (UNE), presents internship opportunities with the NASA Pathway Intern Program. This program will allow students to explore careers and obtain an excellent job experience at the Kennedy Space Center in Florida (US). The areas of internship are: Biology, Criminal Justice, Information Technology, Accounting and Education. Application deadline is: Monday, July 21, 2014. For more information please contact: Ms. Myrna Flores at 787-257-7373 ext. 2622 or via email: miflores@suagm.edu.